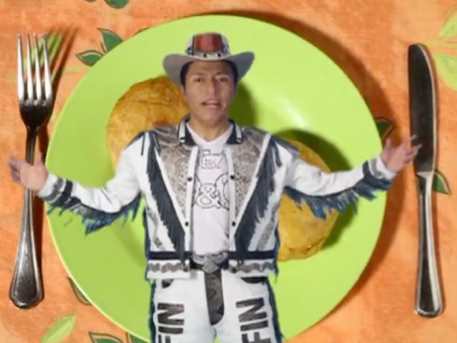 Delfín Quishpe is one of the earliest examples of viral content in Latin America. With more than 14 million visits his video, “torres gemelas,” its probably one of the most viewed videos on the internet. It is an incredibly successful, tasteless, kitsch approximation to a music video. Delfín, known by everyone in Ecuador, as an icon loved by the poor and rural people, a phenomenon the middle class loved to hate and a media product the cultural elite saw as joke. Developing a famous and effective advertisement campaign from that media product was as easy as finding a client with the vision to cash in on it. Sabrosón Oil became that client and vehicle for an unprecedented marketing phenomenon within Latin America that ultimately garnered both harsh criticism and admiration. The campaign required intentionally ugly aesthetics that would match the tasteless, kitsch aesthetic that originally defined "torres gemelas." Recreating these aesthetic with high fidelity was shockingly difficult but defined an advertising strategy that is still talked about almost five years later. Parody video from YouTube’s user Carlos Marquina.